Let's be honest for a second; skeptics are oddballs. The level of rational thought skeptics demand of themselves and others is categorically aberrant. Skeptics proudly adorn themselves in science t-shirts understood by less than ten percent of the population. (We all know that at least one skeptic just thought, “What was the sample size of that study?”) A skeptic is more likely to get starstruck by Bill Nye than Johnny Depp. It should be a surprise to no one when skeptics congregate at conferences, the conversations and talks are nothing short of extraordinary with one-liners that cannot be found anywhere else. Not convinced? Keep reading. 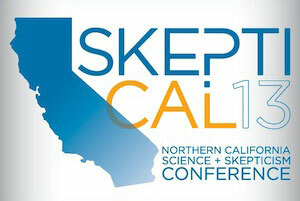 SkeptiCal 2013 will serve as our case study. Nearly 200 skeptics gathered to discuss the favorite topics: UFOs, evidence, paranormal investigation, hoaxes, and magic. Speakers included Eugenie Scott, D.J. Grothe, Julia Galef, Jill Tarter, Laurie Issel-Tarver, and Anthony Pratkanis. James Randi was supposed to make an appearance via Skype at the conference but he fell ill. Tyler Measom and Justin Weinstein filled in for him. Measom and Weinstein are the filmmakers of the film, “An Honest Liar,” a documentary about James Randi. They were explaining the negotiation between Randi and themselves about telling Randi's story. James Randi demanded that if they were going to make a documentary, it could not just be a fluff piece; it had to tell his story, warts and all. To illustrate the difference between legends, hoaxes, pranks, and frauds, Dr. Scott brought up the Piltdown Man. Piltdown Man describes a collection of bones found in England in 1912 once thought to be a primate relative of humans. Even thought it was met with suspicion by many scientists at first, it took over forty years to prove it was a hoax made of human skull bones and lower jaw of an orangutan. During the talk, Dr. Scott referenced other findings that discredited Piltdown Man, including the first Australopithecus africanus skull discovered: the “Taung Child,” the skull of a child approximately six years old. Dr. Scott brought recreations of both Piltdown Man and Taung Child and showed them to the audience to explain how the Piltdown Man hoax was created and why the Taung Child was more credible. As she lifted the mandible, she smiled and commented in the way only an anthropologist can, about the cuteness of the lower jaw. In her talk about heuristics, Galef introduced the audience to different ways to train their brain in order to consider things differently. The easiest method was to place a bet. When asked a question, we can come up with an instinctual answer. However we can assess how confident our rational mind is by placing a monetary bet (even just in our mind) on our answer. Dr. Jill Tarter is a SETI researcher and she realizes the burden of proof will be high if she ever needs to convince the world that she found evidence of extraterrestrial intelligence. Her candid talk about the potential evidentiary shortcomings eventually wove its way to the choices facing earth's inhabitants if an intelligent life form is found in the universe. Tarter thinks a discovery of an outside intelligence would stir people to think of themselves as earthlings and she promotes an earthling perspective while we wait. Jerry Schwartz, Leonard Tramiel, and Jay Diamond shared their experience investigating a paranormal claim. Their claimant, a man who believes has many different supernatural powers, wanted to claim their group's $50,000 prize by proving he could detect gold using a dousing rod. Before the preliminary test, after many hours of fair negotiation, he pulled out. In an act of incredible integrity, he confessed that he did some testing himself and found he could not reach the bar set by the upcoming experiment. Professor and fraud researcher Anthony Pratkanis enthusiastically described how fraudsters prey on people, the myths about fraud victims, and explained why the myths are wrong. He also tackled the common line; how did they get taken for so much money? He explained that it is hard to understand the experience from the outside. It is similar to watching someone on Pirates of the Caribbean but without being able to see the ride. Magician Ryan Kane called out for volunteers in the audience to help him with his finale. When a volunteer threw his hand up, he asked him directly about his willingness to take up arms. Luckily for Kane, the trick went off as planned and no one's face was pelted with a paint-filled projectile. Such diverse and curious comments cannot be found in any other group. The wide breadth of topics under the skeptical umbrella and the intellectual curiosity of the participants makes it a breeding ground for unusual and engrossing exchanges speckled with conversational curiosities.